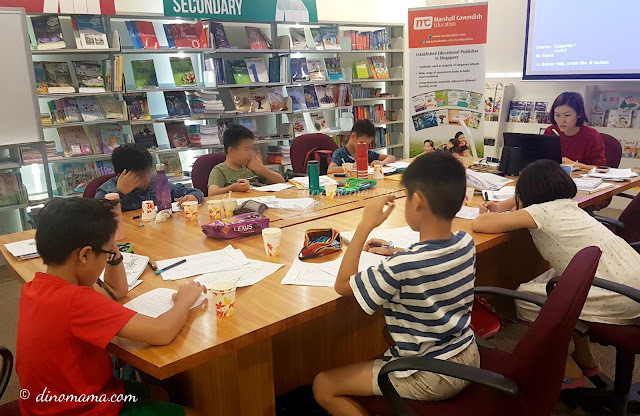 This year DinoBoy will be taking his PSLE or Primary School Leaving Exam, a crucial year for him but our friend seems to be taking it lightly, he hasn't been doing his revision like he used to too. When CA1 or Continue Assessment was near, he told us he had revised his work, confident in scoring good marks but when he received his results and saw that he flunked his Chinese he wasn't upset (because he was 2 marks short of passing), I couldn't believe my eyes, neither can his teacher! I almost want to hold on to his shoulders, shake him so hard that his bones rattles in order to make him wake up his idea and to put in more effort on this subject. After going through the CA1 paper together we realized that he is still not scoring good enough for comprehension, he shared that sometimes he does not understand the passage or his sentence construction especially for the last Open-end Question is incomplete thus unable to score marks. We agreed to work on this area and since then he has been diligent in doing at least one comprehension a day if time permits (homework and CCA takes up much of his time), we are making slow but steady progress. Our usual strategy to perfect DinoBoy's understanding on topics and answering questions are to do revision with assessment books and past year papers, however we know that these are not enough, we have to study smart too! Studying hard means more than memorizing work, format or formulas, we have to grasp the concept and familiarize with the answering techniques too. How can we do that? We were clueless too but we managed to learn a few tricks from Marshall Cavendish workshops where their workshop trainers shared examinations tactics and great studying tips. 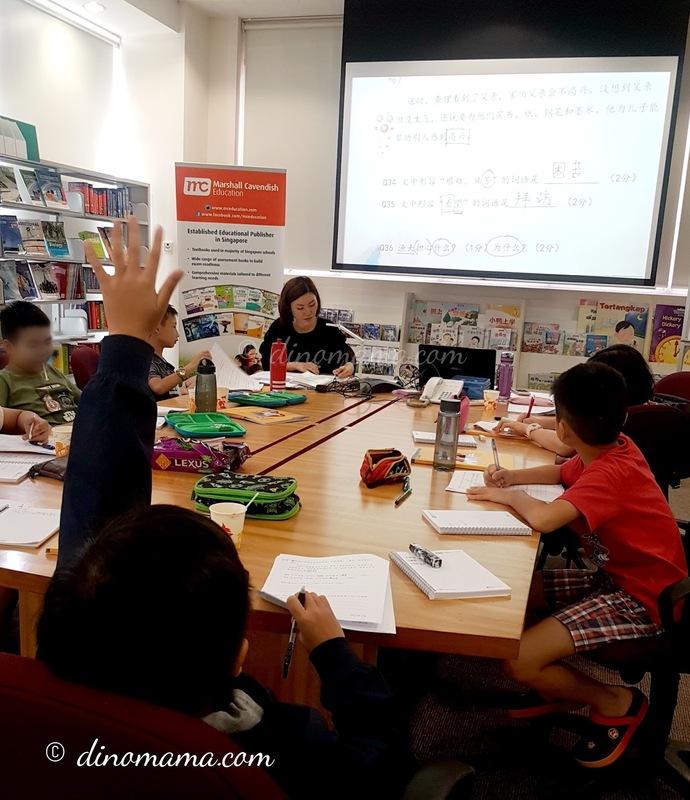 Recently we were back at Marshall Cavendish Education to attend their 2 days PSLE Students' Chinese workshops held on 2 Saturdays with trainer Ms Cha Pei Pei. Ms Cha Pei Pei is one of the selected few trainers who is not an ex-MOE teacher. She is very experienced teacher with more than 10 years’ experience tutoring primary and secondary Chinese. Her students gave very positive feedback on her teaching styles, use of technology and activities to create engaging lessons. She is an accomplished scholar herself, being a former ASEAN Scholar, a top performer in HSK Certificate of Chinese Proficiency and currently pursuing a Doctorate in Education. 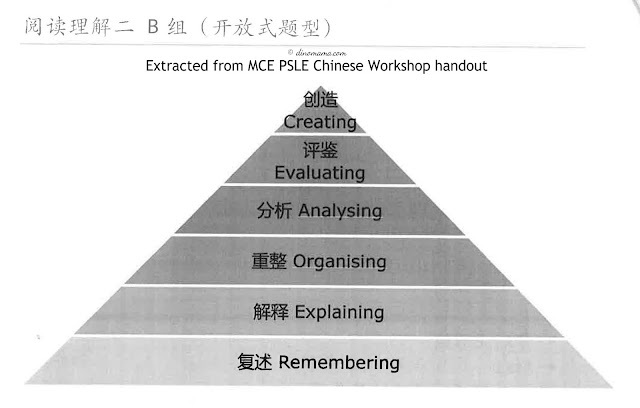 PS : Marshall Cavendish Education hold a separate workshop for composition because it requires a workshop on its own to learn the strategies and useful tip to score Chinese composition writing. The first day of the workshop were spent going through the PSLE examination format and strategy in tackling comprehension. I am sure the students know the drill very well when it comes to comprehension; things such as read the passage twice, highlight important information, read the question and try to find the answer from passage first before writing etc, but not many of them do it even though it may help them understand the passage and making it easier for them to answer the questions. Ms Cha stressed on this "drill" and went through with the children again. I believe that once you have make it a habit to do it, you are already half way in conquering comprehension. If you have been keeping close tabs on our education system, you would have come across this term "higher-order thinking" or HOT, seems like a big scary term but it is a concept education reform based on learning taxonomies. In simple terms, it means the ability to process text at the level of evaluation, synthesis, analysis, and interpretation. Below is an example of Bloom's Taxonomy that was being used during the workshop to help student decipher comprehension questions. Let's take a look at a couple of the skills mention in the taxonomy and apply it on comprehension questions. Remembering - this would refer to questions that ask about the 4W1H; Who, What, Why, Where and How. Answers can be easily lift off the passage. Who saved the dog? How did the children solved the problem? Evaluating - this would most likely refer to questions that carries more than 2 marks as they want the students to infer from the passage and derive with an answer. Students must understand the theme or topic of the passage to answer the 1st part of the question correct. They must be able to lift off the points to support their answer for the 2nd part of the questions. After reading the passage, what do you think about Jack? Why do you think of him this way? For the above questions, it may be difficult for students who is weak in Chinese language or lack of vocabulary to describe a person's character, I know DinoBoy faces this problem. 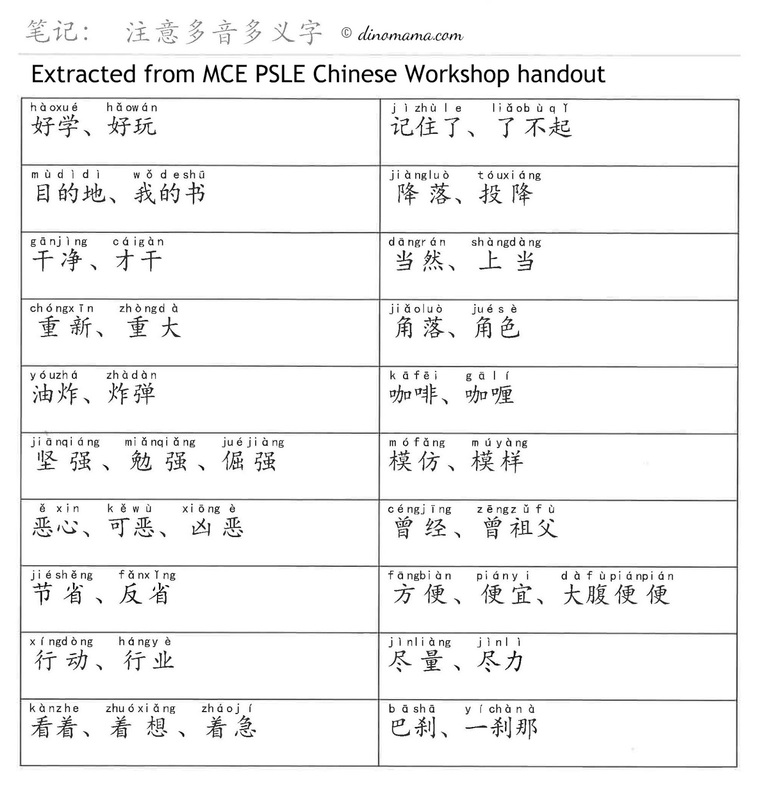 Ms Cha gave a generous list of words for a person's character and shortcoming such as 和蔼可亲 乐于助人 坚持不懈 嫉妒 吝啬 喜欢批评别人 , the children can memorize a handful of it and use it in the answers. The 2nd part of the day were spent putting what they had learn earlier to use by doing the situational writing and a comprehension passage. After Ms Cha went through both the passages and questions with the children, they were given some time to complete it. Once they have finished they can go up to her to have their work marked, just like in school they are required to do corrections and get it marked too. All the trainers takes their job seriously so no slacking here, even if its just a workshop! We went back the following Saturday to learn every thing that needs to know about oral. If you are unaware, students are given 10 minutes to prepare for their oral, this includes reading the passage and watching the short video. We still have to put in more effort to perfect DinoBoy's reading, he is still stammering a bit and he can't pronounce some of the words correctly. I have concern on oral examination as I do not know the format nor the questions that will be given, I mean it is not Math or Science subjects where there are topics or concept that we can practice. These 12 broad topics are definitely a great tips to us! As DinoBoy's Chinese vocabulary is not as strong we can use these topics to practice more by having a short conversation or discussion, introducing any specific terms relating to the topics to him too, for example for 反恐演习 relating terms will be 全副武装的军人手持冲锋枪, 武装部队, 装甲. As if the character strokes for some of the Chinese characters are not complicated enough, we also have to deal with Chinese polyphonic characters. This is a challenge to the children and for the ones who are weak in this language it added on another level of learning challenge for them. 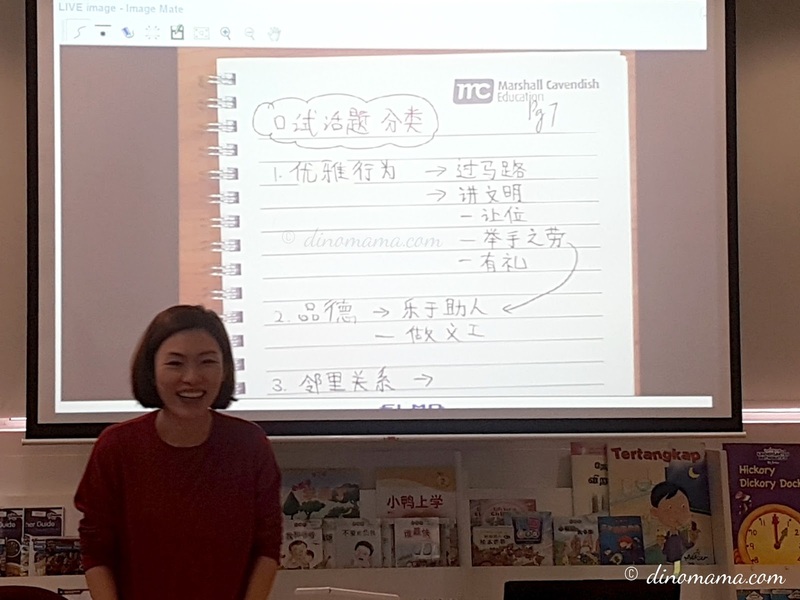 Ms Cha took some common examples of polyphonic characters to share with the children during the workshop so that they are familiar with it and do not mispronounce them during oral. 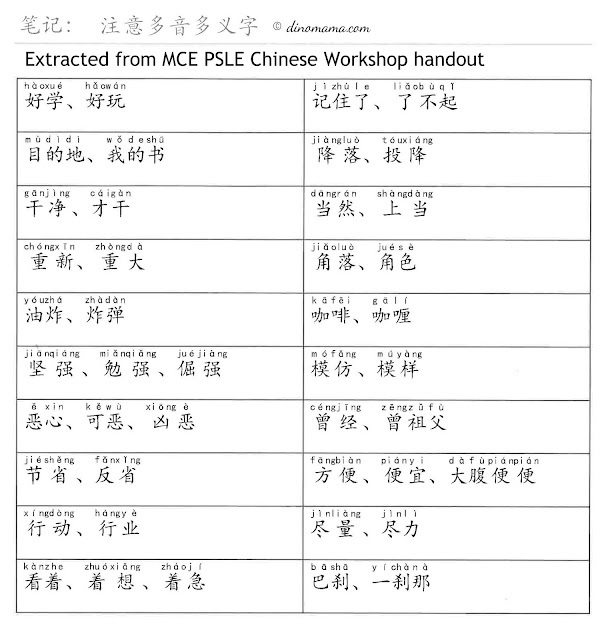 The last part of the workshop is a mini Chinese test that stressed all the children, this simple test is to see if they have put what they learned during the workshop to use. With that the workshop comes to an end. Like before, Marshall Cavendish Education did not disappoint me, I left the workshop with new knowledge on PSLE examination format. I am now less nervous about the oral examnination and have a vague idea how to prepare him for it. Now that I know how the oral examination is being conducted I am also going to get the Chinese Oral Exam Guide for PSLE to help us. You can purchase this online over here. 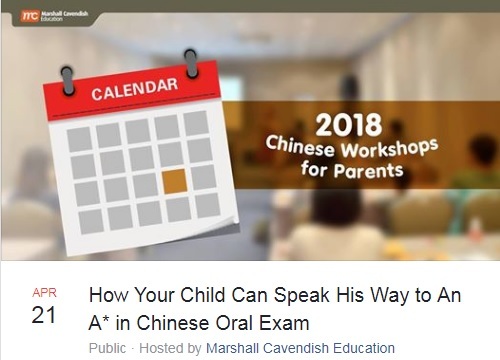 If you want to learn more about the strategies to help your child ace their exam I strongly suggest that you sign up and attend Marshall Cavendish Education workshop. You can look at their workshop schedule over here. 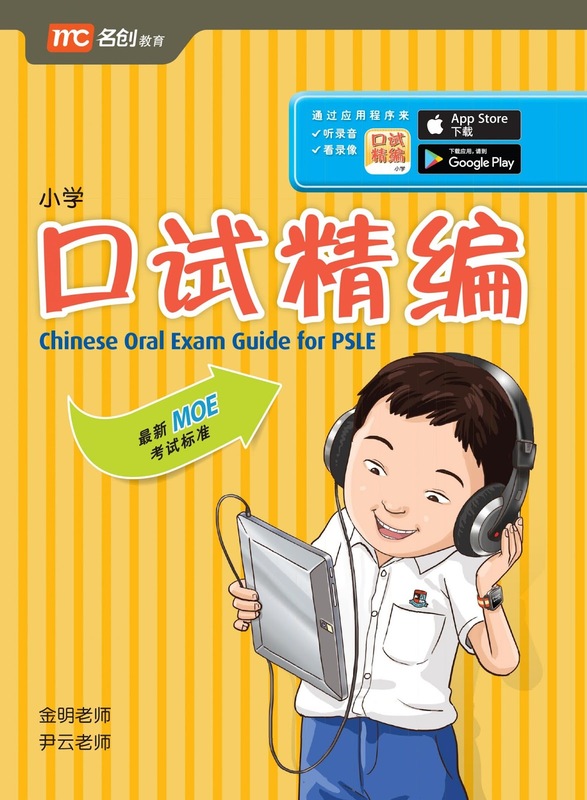 Marshal Cavendish Education has generously sponsor slots in their How Your Child Can Speak His Way to An A* in Chinese Oral Exam workshop and a copy of Chinese Oral Exam Guide for PSLE to 3 lucky fans. The trainer for the Chinese Oral workshop is Ms Shi Bin. She is an ex-MOE teacher. She has over 20 years of teaching experience and is awarded MOE ‘Singapore Model Teacher of the Year’ in 2007. Scroll down further to see our giveaway details. - Tickets are for specific the workshop and cannot be changed. A few of my mummy blogger friends have also attended Marshall Cavendish Education workshops, read about their review on different subjects for different primary level. 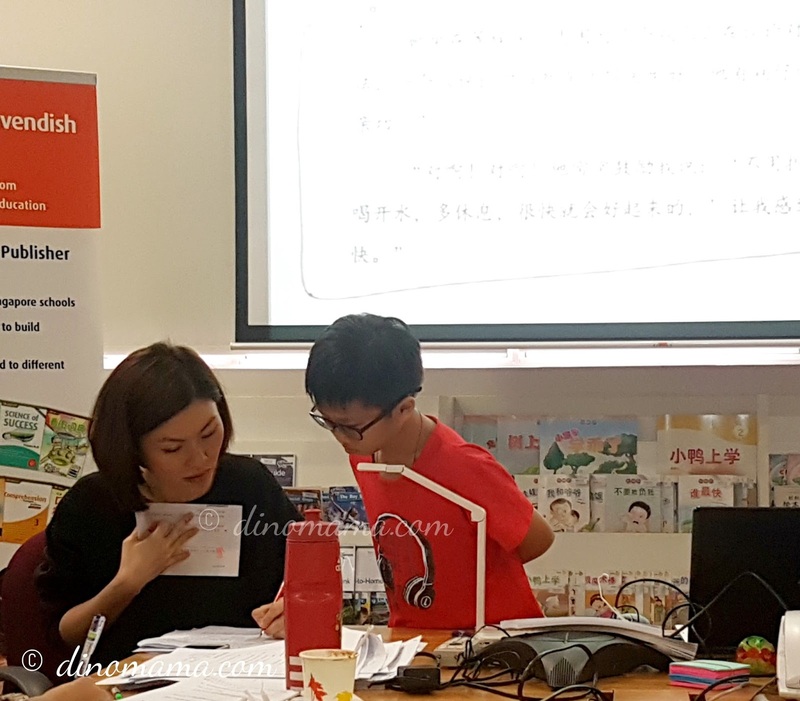 Disclaimer : We were invited by Marshall Cavendish Education to attend the PSLE Students' Chinese Workshop for the purpose of this post, no other compensation were received. The opinions in this post are 100% ours. All photos in this post belongs to The DinoFamily, you may not take it for personal use without permission.